if you follow me on facebook, you may have noticed a couple weeks ago that my fearless homemaker page hit a milestone – 1,000 Likes! i was so excited – thank you all! to celebrate, i sauntered over to our local bakery + treated myself to one of their scrumptious treats: a brownie cookie cheesecake bar. holy moly, it was flippin’ incredible! i knew i wanted to try to recreate something similar at home. so, this weekend, i found a recipe for cookie dough cheesecake bars + decided to give it a try. so, how did they turn out? no joke, this might be one of the tastiest desserts i’ve ever made. they’re swoon-worthy: rich, decadent, + awesome. everything works perfectly: the buttery graham cracker crust, the smooth, velvety cheesecake layer, + the crumbly, flavorful cookie dough topping. put those three together, + you have yourself one seriously delicious dessert. i have no idea how many calories are in each bar, but i’m guessing it’s a lot, + i assure you, it’s worth it! so, next time you’re looking for a new dessert that looks as gorgeous as it tastes wonderful, give these a try! preheat the oven to 325 F. line an 8 inch square baking pan with parchment paper or foil allowing a little overhang + spray with nonstick cooking spray. set aside. mix the melted butter + graham cracker crumbs until thoroughly combined. press the mixture into the bottom of the prepared pan. bake in preheated oven for 6 minutes. remove pan to a cooling rack. do not turn your oven off. while the crust is cooling, prepare the chocolate chip cookie dough. in the bowl of a stand mixer fitted with the paddle attachment or in a large bowl with an electric mixer, beat butter, brown sugar, granulated sugar, salt + vanilla until smooth + thoroughly combined, about 1 minute. mix in the flour on low speed, + mix until just incorporated. mix in the chocolate chips. set aside. in the bowl of a stand mixer fitted with the paddle attachment or in a large bowl with an electric mixer cream together the cream cheese + sugar until smooth. mix in the egg + vanilla on low speed just until incorporated. pour the cheesecake batter into the prepared crust. using your hand to form clumps, flatten handfuls of dough in your palms. distribute the flattened sections of cookie dough on top of the cheesecake batter. be sure to use all of the dough. bake for about 30 minutes, until the top feels dry + firm (the cookie dough) + the entire pan looks set if given a gentle shake. move bars to a cooling rack + allow to cool completely. I have no doubt these are worth every sweet, delicious, caloric bite. I couldn’t wait to see these after you teased us with the picture! Yay congrats on hitting 1000 likes! Those bars are definitely a great way to celebrate. This time of year I’m always on the hunt for new, scrumptious desserts for our tailgates. And this one looks absolutely delish, Amy! CONGRATS on 1000 likes Amy! These are quite the wonderful way to celebrate. I may have to celebrate with you by making these ASAP. I love my cookie dough lol! And that cheesecake layer looks DIVINE. Swoooooning! These are totally gorgeous, Amy! And congrats on 1000 likes! I’d celebrate by eating the entire pan myself chocolate chip cookie dough and cheesecake were meant to be together, kinda like Rachel and Ryan forevah. It just HAS to happen. Amy! 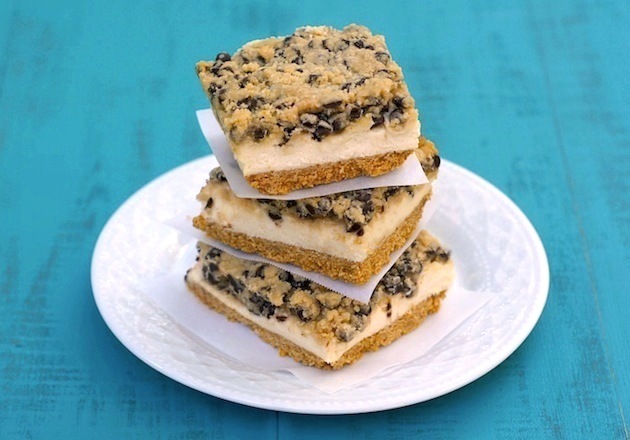 These cookie dough cheesecake bars look magical: lovelovelove the look of these! Woohoo! Congrats on the 1000 likes. I’m just shy of 500 right now and am all excited haha. These bars look fantastic! 1,000 is amazing! Congrats, Amy! You’re a rockstar. And these bars are absolutely heavenly. Cookie dough + cheesecake = heaven. What more could you want?! This could seriously end up being my birthday cake. i like the way you think – these would make an epic birthday cake! Congratulations again on the 1000 likes! And these look a bit naughty but oh well. It’s a celebration! And there’s cookie dough involved. I love your delicious celebration! you are too sweet, angela – thank you! I love cookie dough desserts! Congrats on hitting 1000! These bars are a fantastic way to celebrate! I think I’ll celebrate on your behalf and make these! Congrats on reaching 1,000 likes! I would definitely celebrate also! These bars look really good – I am confident they are as tasty as they look! I could go for two of these right now: one for each hand! I adore chocolate chip cookie dough and cheesecake, so this is a natural for me! Whoa! how decadent!! I can only imagine how tasty these bars are. wow. I’m pinning this one! My sweet tooth has taken a brief hiatus for some crazy reason, but as soon as it comes back, I need to make these!!! i saw these on IG or FB the other day and I about dropped my phone. I’m so excited you posted the recipe!! these look like a great way to celebrate 1000 likes!! ah i’m drooling over here! Thank God bikini season is over! Congrats on 1,000! 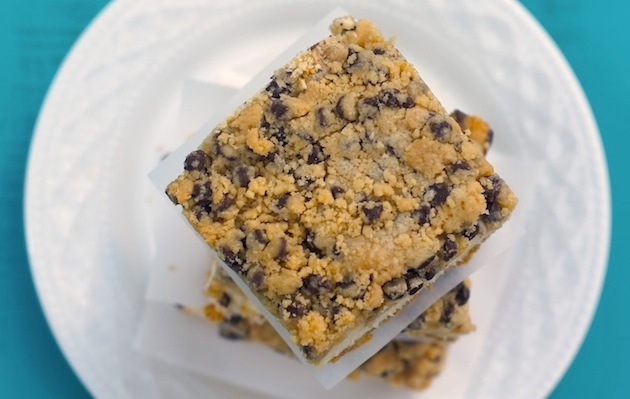 And yeah–I’d say these cheesecake bars are definitely worth some extra calories. Holy yum. I saw your instagram picture and just knew there would be a recipe to follow:-) These are absolutely divine looking…very worthy to celebrate the 1000 likes. Extra calories are ok when they look this good!!! As a cheesecake and cookie junky these are pure evil Amy…seriously evil. I curse you for tempting me with this gluttonous goodness. Oh my word!! These look delicious. I saw you post these on instagram the other day and have been checking your blog everyday to see if you posted the recipe!! Cookie dough and cheesecake I am in heaven. I wish we were neighbors. I would have helped you eat at least half the pan. What a way to celebrate! Congrats Amy! These look incredible! Um, these look perfect. Yay for recreating bakery treats at home so you can justify eating waaay more! OK, LOVING these bars. Seriously so divine- wish I had cream cheese in the house AND that the babe weren’t napping b/c it means I can’t run right out and buy some!! I’m new to your blog- saw you on FoodBuzz and I love it! I’m in Knoxville, TN, so we’re basically neighbors. The Booze Hound is from Boston, too, so it’s like we’re connected on some cosmic Red Sox level, haha. Can’t wait to peruse more of your posts! Love cookie dough and love cheesecake ~ So this is my type of dessert. Thanks for sharing on Foodie Friends Friday and I am going to share it on my facebook page. You know, I almost want to leave a mean comment just because I’m so offended that I don’t have these RIGHT NOW. Sure, I could make them, but believe me, it’s a bad idea to have a pan of these noms just waiting for me. But the nice part of me wants to jump up and down on a trampoline and scream “CONGRATULATIONS” because this dish is perfect, perfect, perfect. Will be voting for you in the Linky Party this weekend! These. look. amazing. Seriously!! I’m so excited to try these! !